Indian Army Notification is out. Indian Army is recruiting for 189 53rd SSC (Men) And 24th SSC (Women) Course Govt Job Posts. You can check Indian Army - Indian Army last date, download Indian Army notification, visit Indian Army official website and check other Indian Army Vacancy details.Complete Vacancy and recruitment Details about 189 53rd SSC (Men) And 24th SSC (Women) Course Govt Job vacancies in Indian Army are provided below by JobSarkari.Com only for you. Last Date of Apply Online. 21/02/2019. Last Date of Submit Complete Form. 21/02/2019. Indian Army 53rd SSC (Men) And 24th SSC (Women) Course. 175. 14. 189. Candidate Must Have Passed Engineering or Applying in Final Year of Engineering Degree. For Widows of Defence Personnel Who Died in Harness Only. Max 35 Years. Height. 157.5 Cms. 152 Cms. Weight. Not Specified. 42 Kg. 3. Candidates are Required to Register Before Applying for the Post and Already Registered Candidate Not Need to Register Again. 6. Upload the Scanned Copy of Documents as Mention in the Application form. 7. Online Application Can be submitted On or Before 21st February 2019. Q. What is the Last Date For Indian Army 53rd SSC (Men) And 24th SSC (Women) Course Govt Job Vacancy ? A. 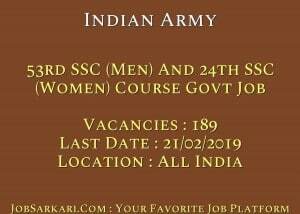 Last Date for Indian Army 53rd SSC (Men) And 24th SSC (Women) Course Govt Job Posts is 21/02/2019. Q. What is the Form Type of Indian Army 53rd SSC (Men) And 24th SSC (Women) Course Govt Job Recruitment ? A. The Form Type for Indian Army 53rd SSC (Men) And 24th SSC (Women) Course Govt Job Posts is Online. Q. 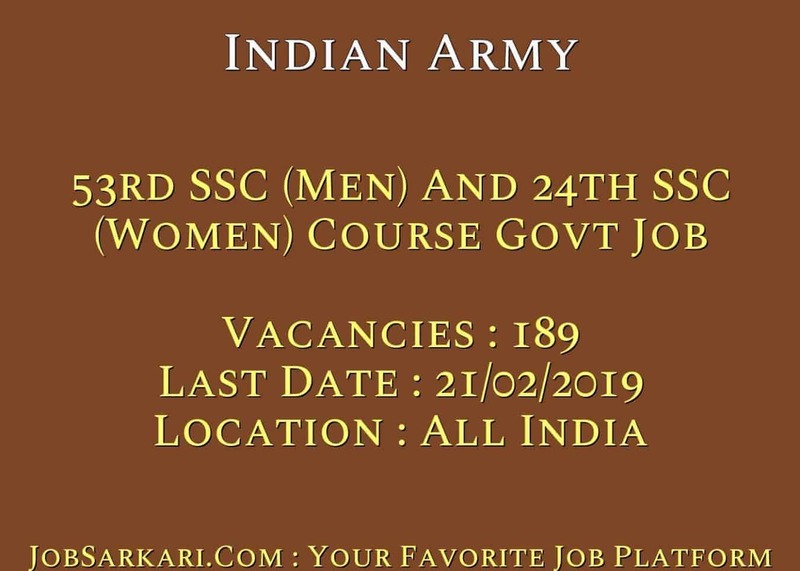 How many vacancies are available in Indian Army 53rd SSC (Men) And 24th SSC (Women) Course Govt Job Posts ? A. There are about 189 Vacancies in Indian Army 53rd SSC (Men) And 24th SSC (Women) Course Govt Job Posts. Q. What is the Full Form of Indian Army ? A. Full Form of Indian Army is Indian Army .